My initial intent was to just pick up a 47T rear sprocket with a 112 link chain. However, it came as a set, so I also grabbed a 12T front sprocket. My primary goal is to have the best possible off-road setup, but I do like to whip around town as well. I will rarely be doing any highway driving, and I really don't have any need to really exceed 65 mph. That's not to say that I don't still plan to ride on the streets a lot though...It's just that most of the roads that I will be riding on have a speed limit of about 35 - 50 mph. I also have the D606 on the rear as well. I know that does make a difference. 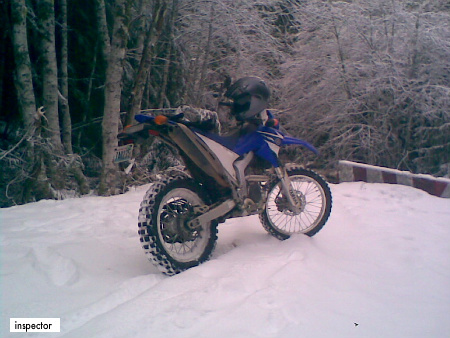 I'm happiest when my front tire wants to lift off the ground by twisting the throttle :). 1.) Should I put both the 12 and 47 on, or should I keep the stock 13 and just put on the 47 in the rear? 2.) Is it really that much of a pain in the a** to change the front sprocket without an impact wrench? Changing the C/S sprocket on my TTR was always super easy, but I've been reading that it's not so easy on the WR due to the fact that it has this lock nut thing on there, and it pretty much requires you to have an impact wrench? 3.) I've been thinking of grabbing an impact wrench for my workshop for a while now, but I don't have an air compressor. I'm wondering if the electric ones are any good? You can get the nut off without an impact. Just use a small screwdriver and hammer to straighten out the dent from the collar first (hard to type in words, but once you see it you'll know what I mean). 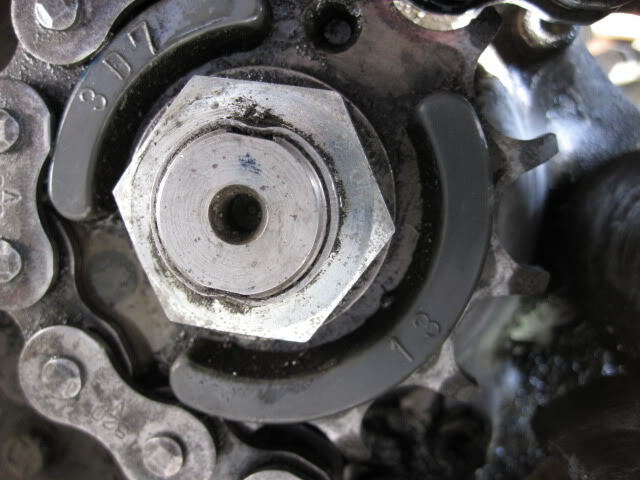 Found this photo to help explain, see how the metal collar on the nut is peened into the keyway on the shaft. Straighten this out and you can easily get the nut off. With the chain still on, I use a 2x4 or a bar through the spokes of the rear wheel, which holds the sprocket and shaft from rotating when you apply torque to the nut. And as far as your gearing changes, I would go incremental steps. Start with 13T, and see how it feels. Then try the 12T and see if you like it better. 12-47 will be really close to 13-50 which I ran for your type of riding. It works well and you can still go 50 mph all day long without screaming the motor but doing 60 is pushing it. This is how most 250 offroad or dual sport bikes are geared, they top out at 70-75 mph and don't like doing over 60 for long. I was doing more like 60 mph most of the time on the road so I went with 13-48, 14-50 is also good for cruising at 60 and riding offroad. I've had a cheap electric impact for 10 plus years now, it works great and they're under a hundred bucks. I seam to have the batteries die from lack of use on all the cordless stuff I buy so I stop buying them. Cool. I think I'll just play around with the rear sprockets then. I have a 47T that's waiting to be put on there, and I think my TTR has the same kinda rear sprockets. I have a 49T on that bike, so if I feel like taking 2 rear wheels off 2 different bikes then I can try out a 49T too. We shall see. Subject: Re: Ordered a chain and sprockets set...couple questions?